We took a long walk from Sandymount Strand to Poolbeg Lighthouse to see off the vessels that were in Dublin as part of the Tall Ships Festival. We started our walk on the beach at Sandymount Strand looking toward the twin towers of Dublin's Poolbeg Power Station. From Sandymount Strand, we hiked through the brush. We approached the Irishtown Nature Park and faced a fork in the trail. SIDEWALK SAFARI SPOTLIGHT: Looking for some awesome things to do in Dublin? Check out our huge list of one day Dublin City itineraries to keep you busy. The Poolbeg smoke stacks loomed closer. We saw a number of people taking a short cut across the sand at low tide on the walk between Sandymount Strand and Poolbeg Towers. We soon approached the starting point of the Great South Wall which was built in the early 1700s and has amazingly withstood the tests of time. Container ships emerged from Dublin Port. Much smaller vessels also shared the channel. We could see Poolbeg Lighthouse standing proud at the end of the wall. Reaching the Goal of Our Hike: Poolbeg Lighthouse! We continued walking and finally made it to the end of the Great South Wall - a bit wind blown but definitely enjoying the Autumn sunshine. We looked up and admired the bright red facade of the Poolbeg Lighthouse. We retraced our steps and hiked back toward the Poolbeg Power Station. We decided to walk along the road to Ringsend rather than take the trail all the way back to Sandymount. We spotted an old stone structure and garden along the way. We saw containers piled high. The road was a bit desolate; not nearly as scenic as the trail between Sandymount Strand and the Poolbeg Lighthouse. We walked into Ringsend Park, a lovely green space. After nearly 10 miles of walking, we decided to stop for a well deserved break at The Bath pub. We tried two bottled craft brews: Goose Island India Pale Ale and O'Hara Irish Pale Ale. We sipped our beer in the light filled pub - very refreshing compared to the usual dark interiors of most Dublin pubs. I suppose the decor was, well, bath colored. There were even some bath related knick-knacks in the cubby holes near the door. Our hike from Sandymount Strand to Poolbeg Lighthouse in Dublin was longer than we expected but it was invigorating on a brisk Fall day. We definitely recommend the walk from Sandymount Strand to Poolbeg Lighthouse as a top walk in Dublin. The route is ideal for a half-day excursion. 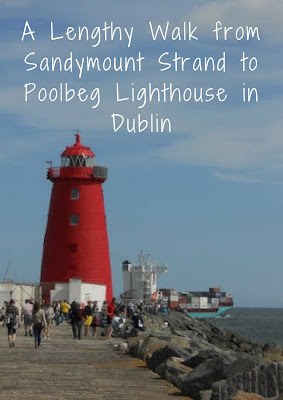 See photos from a lengthy walk from Sandymount Strand to Poolbeg Lighthouse in Dublin, Ireland. A photo-rich post by Dublin-based travel blogger, Jennifer (aka Dr. J) from Sidewalk Safari.